( VMware player, Virtualbox, etc. ). But sometimes you need to use end user type on windows workstation but still want to keep hyper-visor server-ish type. Meaning the virtual guest runs without user logged in. The application reads all VBOX confiration files and runs VBOX in dedicated mode but as a service. It runs in background as a process so there is no user interaction like with standard Virtual box. Except for control icon in task bar. VBOX_USER_HOME includes all Virtualbox configuration files and logs. 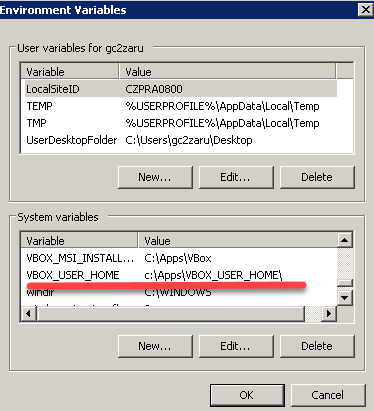 VBOX_USER_HOME is by defualt set in user profile of user who installed Virtual box. Never run vmboxvm service service and Virtual box GUI at the same if you want make configuration changes !!! 3. Start VirtualBox GUI and make configuration changes / crete new machine etc.